Godly Play (ages 3-7 & 8-11) meets Sundays at 10:05 am during the first half of the 10:15 am worship service. There are two tracks: one for youngers (3-7) and one for olders (7-11). 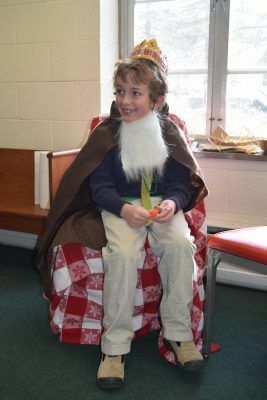 Godly Play is a Montessori-inspired Christian formation program based on the recognition that children have an innate sense of the presence of God. All they lack is the appropriate language to help them identify and express it so it can be explored and strengthened. 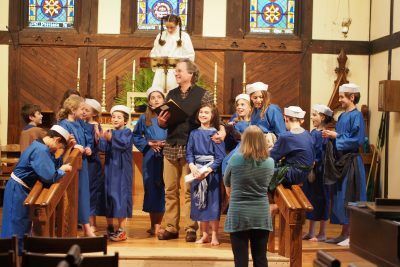 The Godly Play approach teaches classical Christian language in a way that enhances the child’s authentic experience of God so it can contribute to the creative life of the child and the world. Children then join their parents during the Peace so that they may participate in Holy Communion with the rest of the congregation. Youth Forum (for kids 11 years old and up) is held most Sundays from 11:45-12:30 pm. The Youth Forum provides an opportunity for youth to learn more about faith through service, study, conversation, and exploration. Youth Discipleship Group (ages 12 and up) meets every other week on Tuesday evenings during the academic year. The Discipleship Group is a youth-led, hour-long time of prayer, reflection on scripture and sharing. Acolyting (ages 8-adult)- Any child interested serving as an acolyte during the 10:15 am worship can be trained and scheduled to help at our worship service. Please contact the Rector if your child is interested in serving as an acolyte. Nursery Care is offered every Sunday from 10:00-11:45 am for infants and young children. Two experienced adult childcare-providers are available to care for and nurture your children. Kids who find it difficult to sit through the whole church service while Godly Play is on summer break are welcome to play in the Nursery during the service.